Is it true that in the 1970’s that St. Christopher and the St. Christopher Medal were no longer recognized by the VaticanI II sect? Thanks Joann! Yes, it’s true the Vatican II sect supressed the feast days of many traditional saints such as St. Christopher and St Valentine. The excuse was “not much is known about them.” In reality, the Modernists didn’t like the miraculous events in their lives, as they despise the supernatural. So, technically they remain Saints in the V2 sect but they have no feast day since 1970. 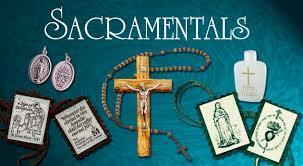 Most V2 “priests” don’t even believe in sacramentals, so they just make a sign of the cross over the medals. They are invalid priests and a simple sign of the cross means nothing. It’s beyond sad. Introibo - I did not know that the modernist’s despised the supernatural. On what grounds and why to they despise the supernatural? I also didn’t know that the Vatican II priests don’t believe in sacramentals. Do you know why? Doesn’t seem like there is anything left that the Vatican II sect hasn’t changed or profaned. His Holiness Pope St Pius X called Modernism “the synthesis of all Heresies.” Indeed, it is. Having rejected scholastic philosophy, it begins with false ideology of agnosticism. We can only know what is perceived by our senses. Since God, the soul, angels, etc., cannot be empirically verified, we cannot know they exist. This is what agnosticism means—the inability to know. As a result, a God “Up in Heaven” cannot be studied. Traditional theology is meaningless, as are concepts such as miracles and Divine Revelation, since these things (the Modernists assure us) cannot be known. The religion of a “God in Heaven” is of no value and must be replaced by an anti-supernatural religion suited to “the needs of modern times.” Pope St Pius X told us the logical end result Of Modernism is atheism. I met a seminarian in the Vatican II sect about 15 years ago who told me he was upset by “superstitious people” who ask to have medals blessed because priests can’t make anything holy and medals can’t “do anything.” Ironically, he had just come back from his assigned task to visit a Hindu temple and see “the goodness” in pagan Hinduism. What actually did the minor order of exorcist allow the man to do before ordination? Anything? Of course this doesn't apply to the NO fake orders. Of course not, Tom! You know better than most that virtually everything they do is null and void! If only more people were as knowledgeable as you. Why is burning holy candles during dinner wrong? What about just burning them to burn them? Blessed candles have been dedicated to God and made sacred for a holy purpose when they were blessed by the priest. To use them as profane candles during dinner would be like using a blessed scapular for a drinking coaster. To “just burn them” during prayer or before a blessed statue/picture of Christ, the Blessed Mother, or a saint, is like a prayer and is a holy use. To burn a blessed candle just to burn it, is no longer using it for a holy purpose for which it is intended. I'd appreciate hearing if anyone else has information or opinions on two points regarding sacramentals. 1. Can holy water be diluted with tap water and still retain its blessing? Someone said this once, but I doubted it and have never done it. But perhaps this is correct. 2. How about giving a blessed object to a fallen-away or non-Catholic as an attempt to convert them? I know of people who have done this, but it seems that there would be a danger of the recipient, out of either anger or ignorance, committing a sacrilege. Wow! You ask great questions Barbara! (Difficult ones too)! As to # 2, it is permissible to give non-Catholics or fallen away Catholics sacramentals in an attempt to convert them. (Especially the Green Scapular). Unless there is a SUBSTANTIAL risk of sacrilege(highly more likely than not), you may give it to them nevertheless. According to Theologian Jone, tap water may be added to Holy Water, as long as it is certain that the amount added is less than the amount of Holy Water. It then retains the blessing. (See Moral Theology, pg 322 regarding baptismal water, of which Holy Water May be employed). Hope this helps, Barbara! If any of my readers have additional information with a citation, please pass it on! A few years ago I was given a JPII Rosary. How would I dispose of it? If it’s not blessed, you can throw it out. If it is, cut each decade into pieces and bury it about 6 inches underground. Thank you for this entry,it's extremely informative. The Mother of God said that "whosoever dies wearing the scapular shall not suffer eternal fire". So why it is possible to believe that one can die wearing it and go to hell? I thought if some sinner is going to die with it, the scapular would fall or something else, and he would died without it. Sacramentals are not “magic amulets.” They cannot assure salvation. No one is bound to believe a private revelation, even one approved by the Church. Granting that is what the Blessed Mother said, it is with the understanding that you are trying to live a devout life. Then you can be given the grace of final perseverance, an act of perfect contrition or the Last Rites can take you to Heaven.